I have external hard drive Transcend. Previously I could work with it without problems , but I did not use it for two month. I can see HD in Disc Utility , but I can't see it in Finder. Is there a setting to change that would prevent or cause the vipooume to show in finder? Weird=( How I can check the reason of error and make it work? Since yours shows in disk utility, I would either run a verify or repair operation based on if the data is backed up elsewhere. This could be the first sign the filesystem or hardware are failing and when you “repair” a filesystem, sometimes that deletes bad files or causes other data loss. It could also be that the filesystem check is taking hours and that given enough time, it will mount again rapidly once a full check is done. You can see those check details in the disk utility or possibly in /private/var/log while the checks run. 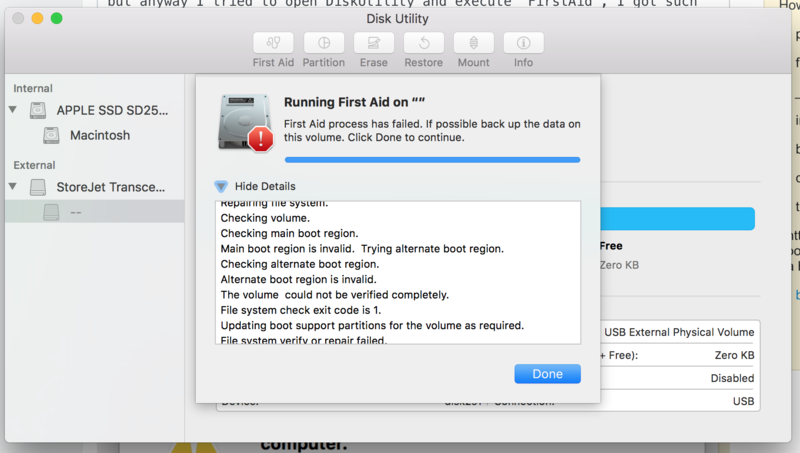 If Disk Utility won't fix it you can try a third party disk repair utility. I use DiskWarrior but there are others. No guarantees any will work, it just depends on how much the data on that drive is worth to you. The problem might also be hardware related. EG no disk repair utility will fix it. If third party disk repair utilities fail you may have to ship the drive off to a data recovery specialist. That can get expensive. Not the answer you're looking for? Browse other questions tagged macos finder disk-utility . Force Repair/Unmount External Hard Drive? Apparently damaged external disk drivers. Can they be repaired?